It’s fitting that the 9-mile Iron Goat Trail is centered in the town of “Scenic” as that’s just what you’ll get on this rustic adventure: beautiful views of mountains, waterfalls, wilderness, and wildflowers. 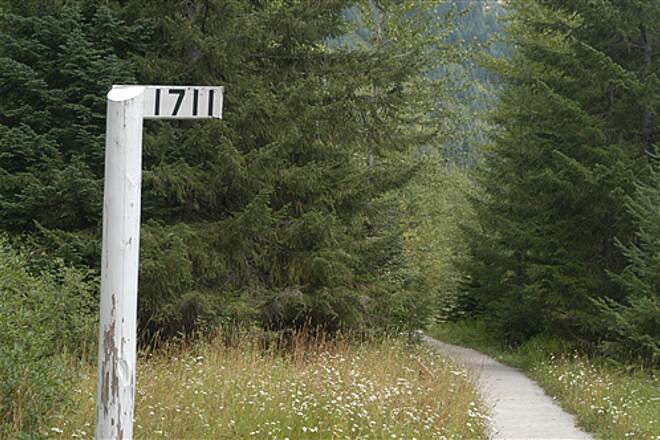 Located about an hour’s drive east of Seattle, this hiking-only pathway is nestled in the evergreens of the Cascades and follows the late 19th-century route of the Great Northern Railway. As the railway's logo featured a mountain goat, the line became known as the "Iron Goat." 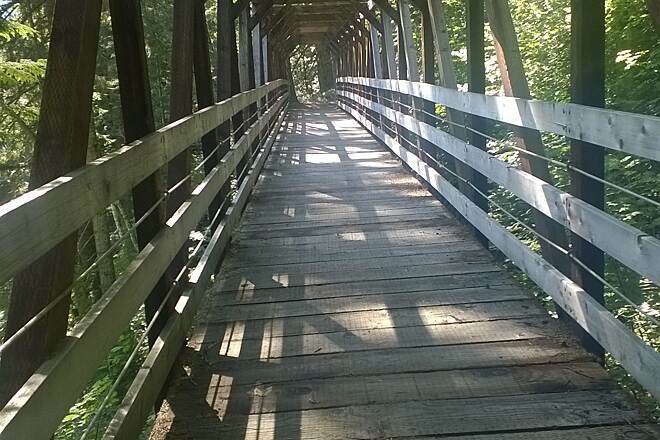 Nods to the rail-trail’s history abound and interpretative signage along the route tells the corridor’s story. Beginning at the trail’s eastern end in Wellington, you will soon be immersed in a concrete “snowshed” spanning more than 2,000 feet. 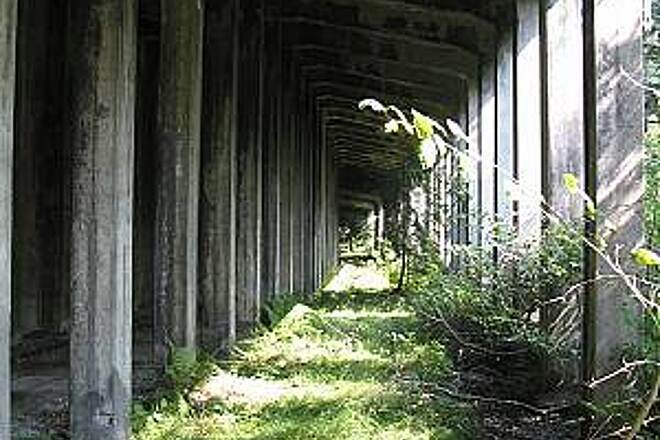 The towering tunnel-like structure was built to protect trains from avalanches after nearly 100 people lost their lives in a 1910 railroad disaster caused by one. Another interesting find is one of the original mileposts that notes the distance to St. Paul, Minnesota, where the railroad route began. From Wellington, it's a 3-mile hike to Scenic, where the trail splits and forms a 6-mile loop.The trailhead here is called the "Iron Goat Interpretive Site" and includes a cherry red caboose. 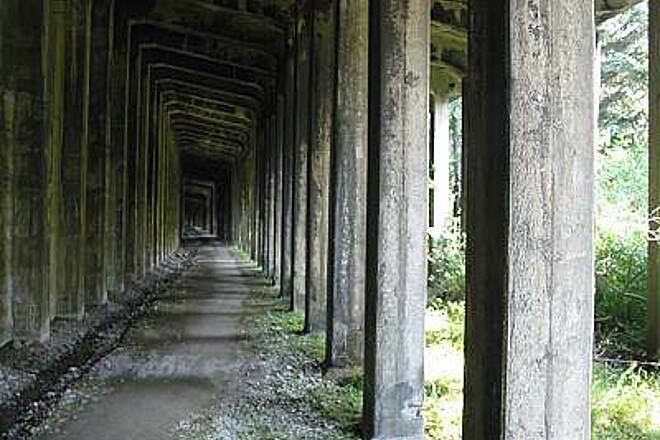 The looped section of the trail is dotted with several railroad tunnels, which you can peer inside but go no farther as they are considered unsafe to enter. 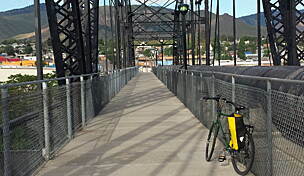 The lower leg of the loop is a wide, ADA-accessible gravel route, while the upper leg is steeper and rougher and therefore not wheelchair accessible. 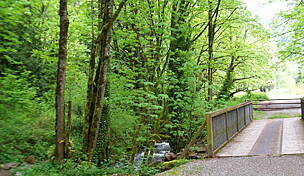 At the west end of the trail, you'll reach the Martin Creek Trailhead, where a pit toilet is available. Notes: You will need to purchase a Recreation Pass to use the trail; they can be obtained from the U.S. Forest Service’s website. Leashed pets are allowed on the trail. Parking and a vault toilets are available at the trail's eastern trailhead in Wellington (near Stevens Pass), mid-trail at the trailhead in Scenic (off Old Stevens Pass Highway), and at the Martin Creek Trailhead (off FR 6710) on the trail's western end. 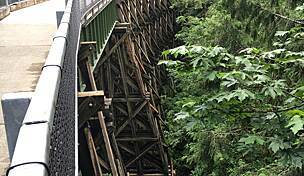 The Iron Goat Trail is the abandon roadbed of the original Great Northern Railway over the Cascade mountains. The line opened in 1893 with switchbacks over the top. 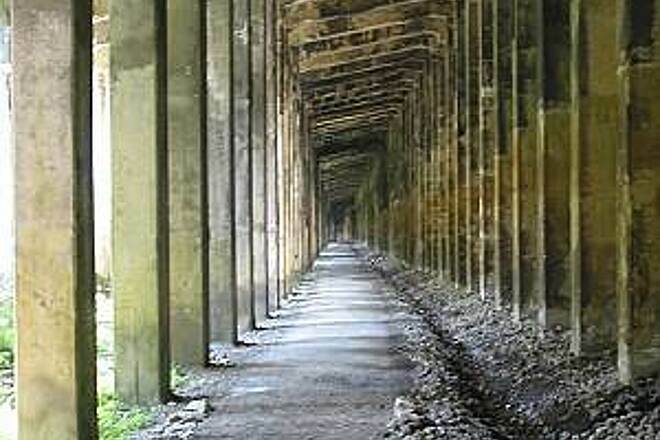 In 1900 the original Cascade Tunnel opened. It was 2.663 miles long. 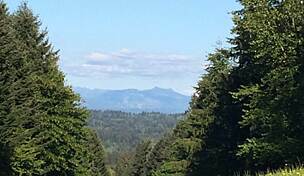 This line was abandon in 1929 when the present Cascade Tunnel replaced the line. 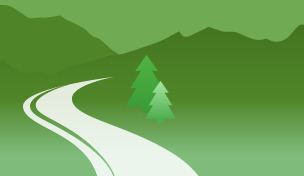 The trail is nine miles long but is not steep or difficult. It is nine miles long so be prepared with anything you might need. There are no ammenities on the trail. At Wellington there is no trace of the town. 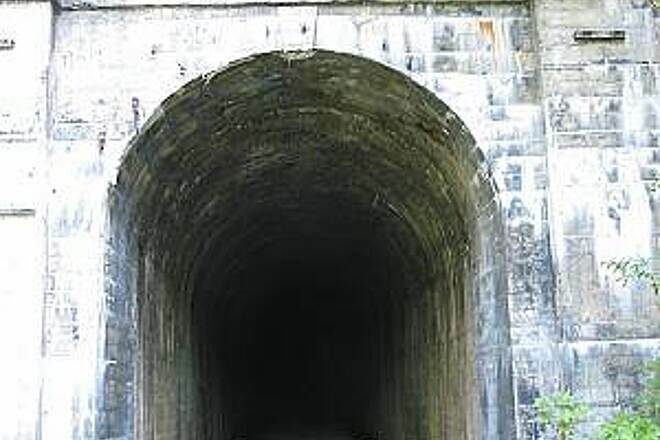 There is the west portal of the original Cascade Tunnel. The foundation of a water tank and a coaling tower. The concrete snowsheds built in 1911 are there too. 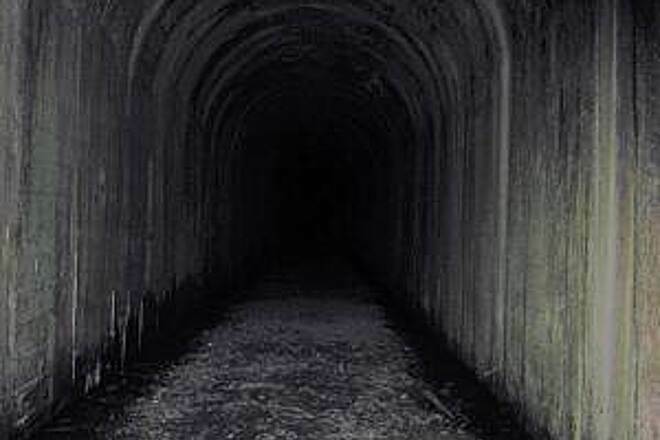 DO NOT ENTER any of the tunnels on the trail. All are caving in or have caved in. BE SAFE and STAY OUT OF THEM. At the trail heads of Wellington, Martin Creek and Scenic there are pit toilets and a parking area. Take only photos and leave only footprints. STAY ON THE TRAIL too. The Iron Goat Trail is a excellent hike. Especially after reading the history of the trail. 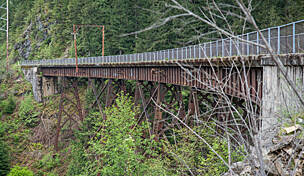 The IGT is the abandon roadbed of the Great Northern Railway and was built in 1893. 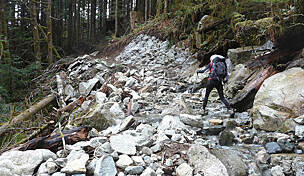 The BIG cement walls along the trail are the anchor walls that held a snowshed into the mountainside. The wooden parts have rotted and collapsed. The trail is not difficult but is nine miles long. At Wellington there is the west portal of the original Cascade Tunnel built in 1900. The tunnel is 2.63 miles long. The draw to this trail is that the Great Northern RR (now known as BNSF) pumped in a ton of money to build and maintain this trail before abandoning it in 1929. Tye or Wellington is noted for a slide that killed aprox 96 people in 1910. The history is rich in this area and was heavily photographed by locals who worked for the railroad. Lee Picket took aprox. 5000 photos in the 30s, most are archived at Central Washington Museum. Then around in the early 90s the Forest Service in cooperation with the Mountaineers and Volunteers for Outdoor Washington painstakingly and carefully constructed the trail to help preserve the history. In addition interpretive signs with copys of historical pictures are placed at key points of interest. The lower part of the trail is wheelchair accessible. One of the founders of the trail, Sam Fry, was injured and I had the honor of pushing his wheelchair on the trail. The 2.2% grade makes it easy to push uphill. 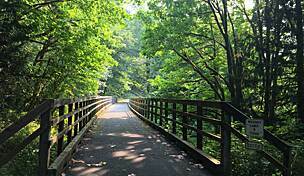 I have hiked many rail trails but the history makes this trail much different and well worth the journey. I make it a point to visit it each year. Its only real bad point is that it is 9 miles long. Bikes and horses are prohibited and is well enforced. 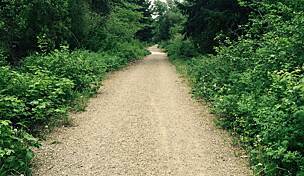 Hiking the trail in its entirety is difficult, even though there are 2 return loop trails. 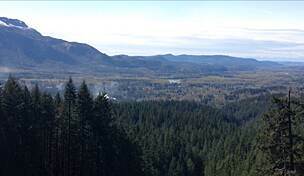 "This trail is only for hiking, and you will need a NW National Forest permit fee. The trail is short, only about five miles. Although it's only for hiking, I did see some tire tracks on the trail. I didn't ride, I hiked it. There is a snowshed that's neat and has a view stand at the tunnel portal. There is no barrier to walking the tunnel, but you will need lights, and there is a sign warning about possible falling concrete hazards, so walking the tunnel is at your own risk!"